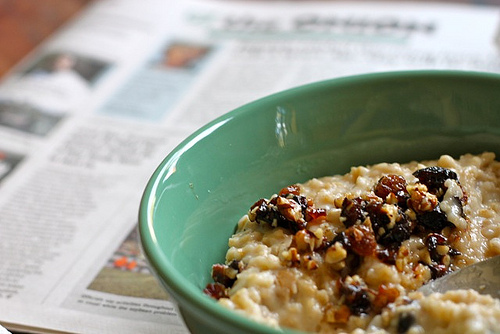 Sunday Morning Oatmeal is not your average, every day oatmeal. 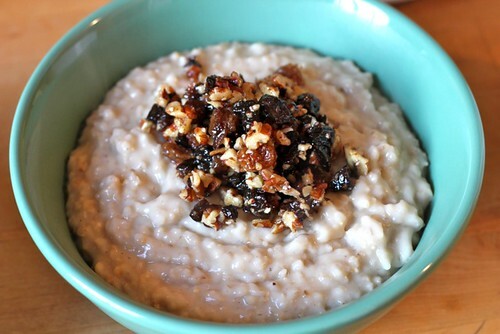 It’s an oatmeal that, if you ate it every day, might kill you. But on Sunday morning, death is the furthest thing from your mind; you’ve got the Sunday Times Magazine crossword puzzle open on the table next to you (you look for all the food clues first, naturally) and Bon Iver playing on iTunes (well, Craig does, I just liked it and asked “What is this?” and he said “Bon Iver.”) There’s no set formula for this Sunday Morning Oatmeal, you just wing it as you go. But it’s best if you start the night before, right before you go to bed. 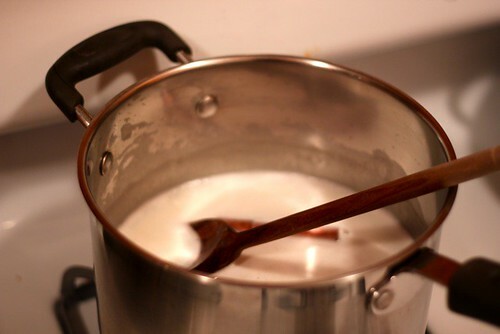 On Saturday night, assuming you didn’t stumble in bleary-eyed at 4 AM, go to the stove and fill a pot with 3 cups of water and 1 cup of milk. (You could play with that ratio if you want; more milk makes it that much creamier. You just want 4 cups of liquid total.) Throw some spices in there to perk things up: this past Sunday I threw in a whole cinnamon sick (which I should’ve broken in half, it draws out the flavor), some crushed cardamom seeds, and a grating of fresh nutmeg. Bring that to a boil and then add 1 cup of steel-cut Irish oats (the slow-cooking kind), a pinch of salt and let it boil for one minute. Then turn off the heat, let it cool down enough that you can put it in your refrigerator without burning the refrigerator shelf; cover and place in the fridge overnight. 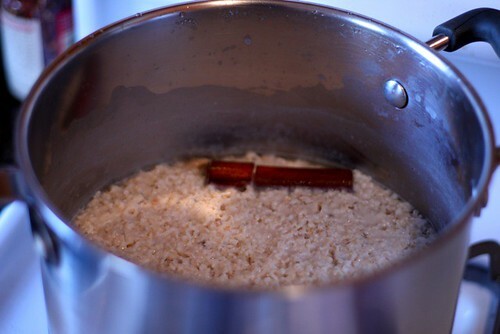 Remove the cinnamon stick and turn up the heat to about medium. As it begins to heat, stir it all around so it doesn’t scorch on the bottom. 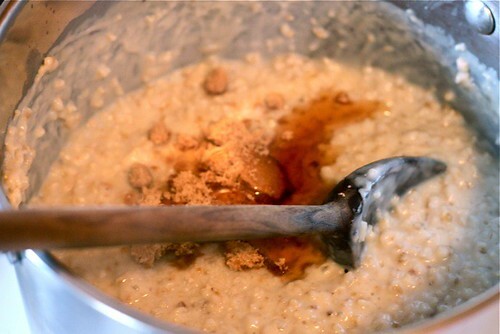 Continue cooking and stirring for about 8 to 10 minutes as it starts to bubble and cook. You don’t have to stir constantly, just every few minutes or so. Eventually, you’ll want to start tasting to see if the texture is to your liking. It should be creamy and only slightly toothsome. 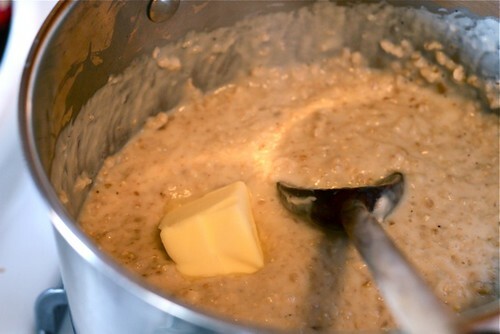 Now the fun part, the part that makes it Sunday Morning Oatmeal. Stir that in and taste. Often times, it needs more sugar than you think it will to taste good. Adjust accordingly. Stir that in and taste again. It should taste wonderful; like the best oatmeal you’ve ever had. (Hint: adding another pinch of salt often helps.) If it tastes like the best ever, you’re almost done. 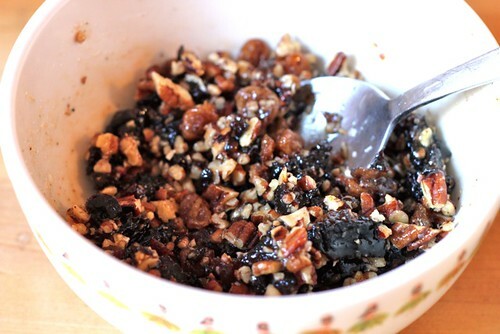 Last weekend, I decided to gussy my Sunday Morning Oatmeal up even more by making the filling for Dorie Greenspan’s baked apples (recipe here) and spooning that on top. And there you are: Sunday Morning Oatmeal. Hope it makes your Sunday special.